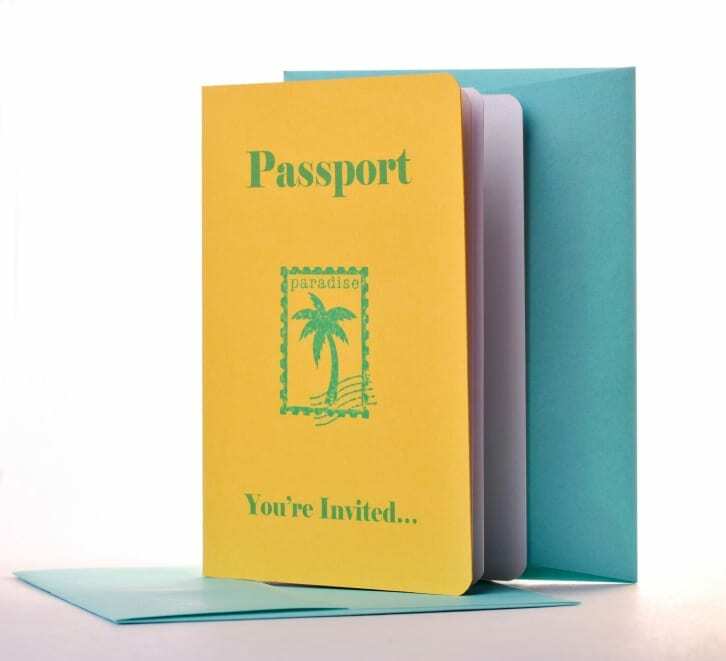 These DIY Passport Style Invitations are perfect for any internationally themed dinner party. They would also be right on theme for any bon voyage or welcome home parties for someone who has been abroad. We love them because they are creative, easy, and adaptable. We hope you enjoy making these as much as we did. Print the attached template onto the brown card stock. If you do not wish to use brown card stock, choose any other color that you take a fancy to. However, be sure that the color you do choose is easy to read black printer ink off of. You want to ensure your guests immediately see the passport emblem, so choose a lighter color. Once the passport template is finished printing onto your card stock cut the card stock in half—width wise or “hamburger style”. Now, you should have two pieces of card stock that say “PASSPORT” on the right-hand side. Focus only on one of those pieces for now. Fold that piece so that “PASSPORT” is on the outside. Congratulations, you have finished the first step. Take one of the 8-1/2” x 11” printed map pages and hold it in your hand “portrait” wise. Fold the page in half width wise so that there is a crease at the top of the page. Cut along that crease so you make two pieces. Take one of those pieces and fold it in half length wise, or “hotdog style”. Match the folded creases of the page and inside of the passport exterior, with the map page facing down. Staple those creases together. Now you should have two pages in your passport. Using your sharpie or felt tip pen, write the party details onto the pages of your passports. Be sure to include the address, date, and time of your event, plus the host’s phone number and RSVP date. Your invitations are now complete. Place invitations into their envelopes and send out to potential party guests at least two weeks before your party. If you wish to be a little more fancy, you could choose to add gold or silver permanent marker accents onto the passport by outlining parts of the design on the cover. If your party is going to be held as a going away or as a welcome home party, the map pages of the invites could be of maps of their destination. That level of detail always adds an extra personal touch which helps parties really shine. These Passport invitations might also be pretty cool for a spy-themed party, should you choose to accept it. This blog post has a bunch of cool travel themed decorations that would support these fabulous invitations.